Army Pfc. 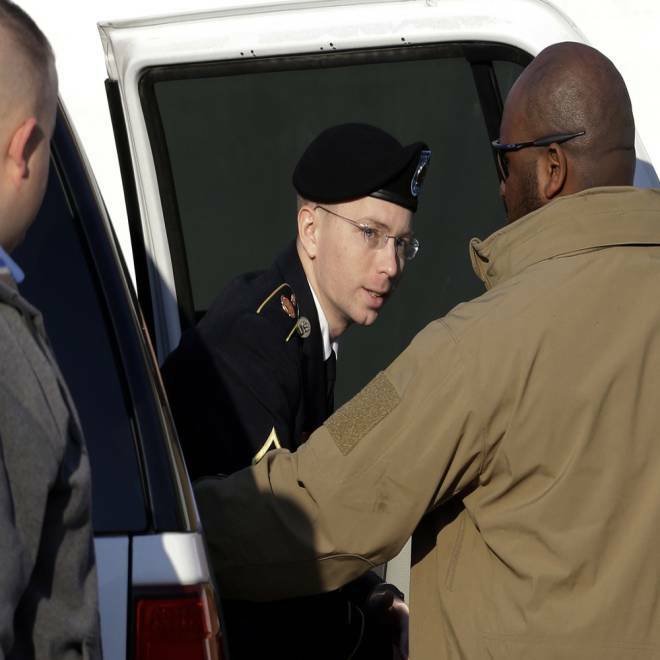 Bradley Manning steps out of a security vehicle as he is escorted into a courthouse in Fort Meade, Md., on Nov. 29, 2012, for a pretrial hearing. His most detailed explanation involved the release of aerial weapons team video showing airstrikes that killed some Iraqi civilians and several Reuters journalists. “It was troubling to me" that the U.S. military in Iraq wouldn't release the video, he said. Also disturbing was the "seemingly delightful blood lust" exhibited when members of the air crew referred to the civilians as "dead bastards" and congratulated one another on their ability to kill large numbers of people. He said he was encouraged by the public response, that others were "as troubled" as he was. In addition to the charge of aiding the enemy, Manning pleaded not guilty to counts alleging theft of U.S documents or videos -- including allegations that he stole the list of all of the emails and phone numbers of U.S. military and personnel in Iraq at the time -- unauthorized access of that information and downloading unauthorized software onto government computers. The charges to which he pleaded guilty included intentionally causing intelligence information to be published on the Internet, improper handling of classified information and counts of conduct prejudicial to good order and discipline. Some Department of State cables. At his court martial, Manning’s defense is expected to argue that he considered himself a "whistleblower" and released the documents with "no malicious intent" or the intent to do "any harm to anyone." The government contends the release of the documents put some lives at risks, including the names of Afghans who were working with the U.S. military and intelligence. Jim Miklaszewski is NBC News’ Chief Pentagon Correspondent and Courtney Kube is NBC News’ National Security Producer.